It's that time of year again Addicts, time to be entertained by three of our Masters of Macabre! This year’s challenge is Haunted Houses. They come in all shapes, sizes, and locations with as wide a variety of ghosts, ghouls and poltergeists. See how our Masters handled their particular challenge by listening to the show airing this week at HorrorAddicts.net. To vote, send an email to: horroraddicts@gmail.com with the subject line: MMM. Voting ends September 24th, 2013, 11:59a, PST. 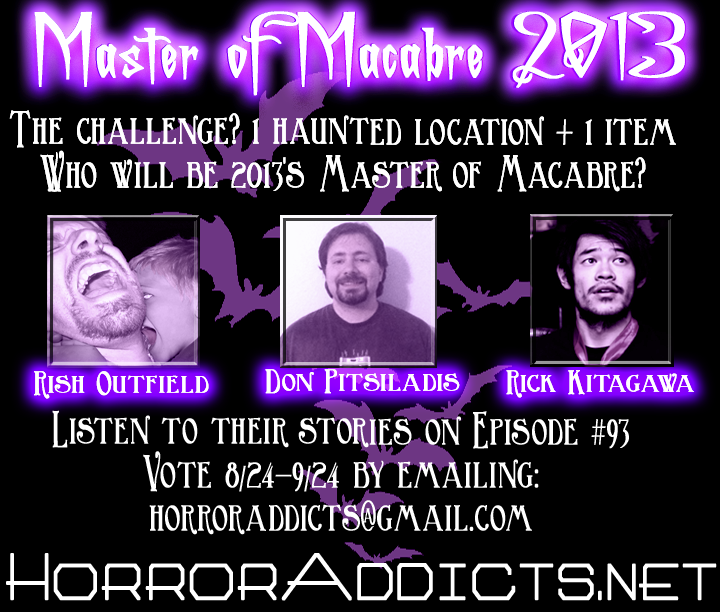 Listen to or read their stories this week on HorrorAddicts.net and vote to win a HorrorAddicts.net prize pack!